How NOT to bribe a policewoman when you’re busted for riding a moped on the interstate. Yes, that’s dozens of low-speed collisions from Chinese security cameras. Car-on-car. Car-on-scooter. Scooter-on-scooter. Scooter-on bicycyle. All of the above-on-pedestrian, and my favorite, Tuk-tuk-in-reverse-on-multiple-pedestrians. It’s very tragic, yet a little bit funny (just like Gome) At least everyone seems to be moving pretty slowly and no one is hurt, at least not visibly gored. Try not to picture any of those collisions on American streets with SUVs going twice as fast. 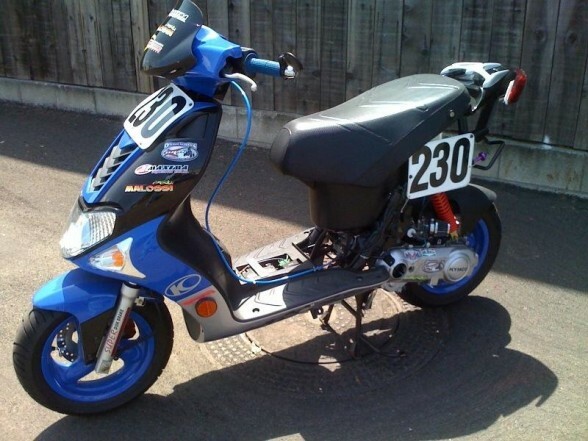 If you’re interested in scooter racing at all, read on! Simply put, there’s a big schload of scooter racing going on this summer, and that is awesome. MARSC: Mid Atlantic Scooter Racing Commission (MD, NJ, and VA). MWSR: Mid West Scooter Racing (OH). NASRA: North American Scooter Racing (IN and OH) including the Scooterworks Drag Race Series. MSILSF: Motor Scooter International Land-Speed Federation (CA). Are we missing anyone? (Probably!) See any errors? (blame Google Calendar!) In either case, please let us know! You’ll see we’ve added a new series of events, following the success of Twist and Gone in May, the North American Scooter Racing Association is hosting a full season of drag races in Nashville, IN, sponsored by Scooterworks. One last bad news/good news bit: MWSR’s organizer Seth tells us that the race this weekend at G&J Kartway in Camden, OH has been postponed, but the good news is the track will be open to scooters for only $10. The one major complaint is that 50cc scooters are limited to 40mph speed, which is under the capability of many 50cc scooters. That’s a bit of a drag, but it makes sense. That’s an arguably-reasonable speed limit for someone without a motorcycle license, and it makes it easier to weed out people cheating the system. At Amerivespa in Denver a few years ago, I remember seeing more than one Vespa GT 250 with the “2” snapped off, and many other bigger-displacement scooters with homemade “50cc” stickers. 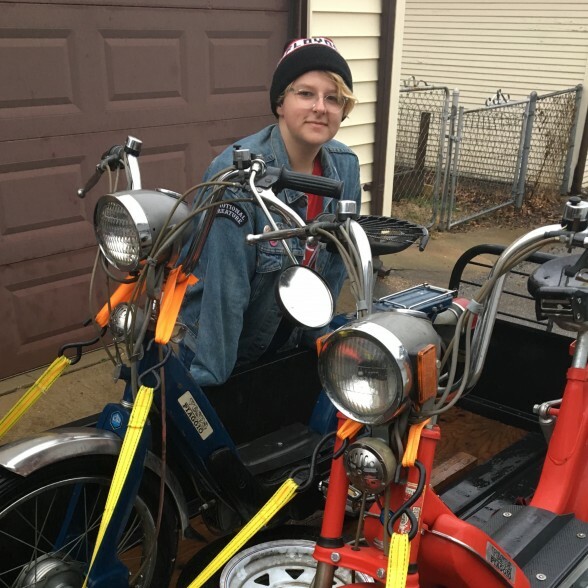 I can’t imagine police would issue citations to anyone with a motorcycle license on an insured 50cc scooter riding responsibly, unless they were REALLY speeding. The Mid Atlantic Scooter Racing Commission has updated their race schedule (and we’ve updated it on our 2SB rally calendar. MASRC is offering an ambitious 16 events this season, the highlight of the season looks to be Virginia International Speedway on June 26-27 2010, with US Mini GP. 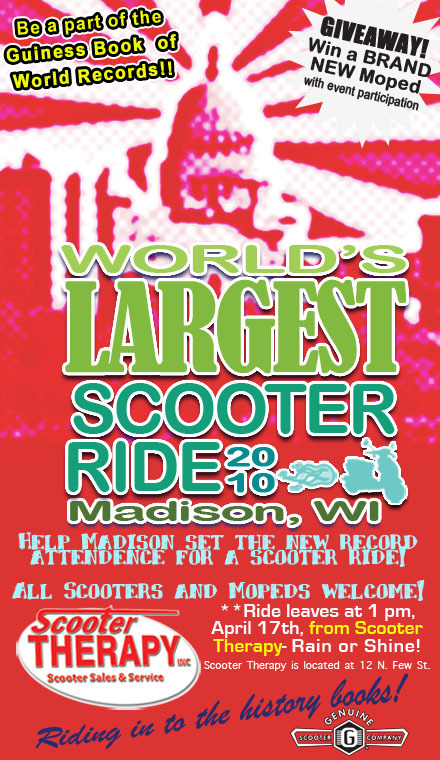 Scooter Therapy, Madison, WI’s Genuine/Kymco dealer is attempting to enter the Guinness Book of World Records on April 17 with “The World’s Largest Scooter Ride.” We heard rumors of this a couple weeks ago, and found it curious: Isle of Wight organizers brag that their 2008 Sunday ride was Guinness-verified as the world’s largest parade of scooters with about 5000. Even though there’s no mention of this record on Guinness’ site, European rallies routinely top 1000 scooters. It turns out, despite the vague name of the event, Scooter Therapy is trying to break a 2005 Dutch record for Largest Parade of Mopeds (motorcycles Under 50cc), which currently stands at 674. All mopeds and scooters are welcome, but only those under 50cc will count towards the record. I don’t know what kind of moped population Madison has these days (maybe it’s through the roof, unlike most states, WI law clearly specifies 50cc scooters as mopeds, legal to operate with a regular driver’s license, and Madison is a relatively affluent college town) but that still seems like a lot of bikes, considering that the biggest (and more-publicized) midwestern scooter and moped rallies rarely attract half that many. When you limit it to 50cc bikes, and hold it on the same weekend as a big moped rally in Louisville, that just doesn’t seem possible, but maybe they know something I don’t. In any case, it’s a ride, it’ll be a good time, and they’re giving away a Genuine Roughhouse 50, so if you’re in the area you’ll want to check it out. Here’s hoping they pull it off and steal the title from those stinking Nederlanders! Update: More, in English from The Scooter Scoop. Polini Cup action resumes this weekend (September 5th & 6th, 2009) with moped, scooter, pocket bike, Go-ped and Kart racing in Atwater, CA. As usual, MopedTV will provide live coverage. Here’s a good brief rundown of the Soviet-era scooter industry, featuring some good photos of the Tula Turist and T-200, and a 1974 Vyatka “3,” which I’d never seen before. If that’s not enough Warsaw Pact-ion for you, Autosoviet has lots more info and photos of Tula scooters and Vyatka’s better-known Vespa knockoff plus more than you ever wanted to know about Vostok, Dnepr Minsk, Voskhod, CZ, and more. Late notice again (sorry!) but check out Polini Cup Moped, Scooter, Pocketbike, Goped and Gokart racing live this Saturday and Sunday on MopedTV. The live coverage from Tom Dash Memorial Speedway, Atwater CA, starts at 1pm local time and features interviews, race coverage, and giveaways from Corazzo. Corazzo’s also offering a free t-shirt with all jacket orders placed on June 6th and 7th, just mention Polini Cup when you order.